In this article, I'd like to explain which items should be purchased in what situations in order to solve the problem: (I do not know which items to buy :() that is prone to beginners. 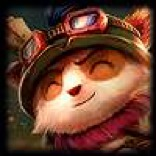 Even if you understand the ability of the item correctly and make it possible to change the build according to circumstances, circumstances, it is okay for winning percentage up mistake, because "Because Champion.gg and OP.GG are attached to me!" It is nothing! There are a lot of items in this game, so separate articles. This time it is 1/2 of the AP item volume. I will explain the items that mana and AP can have. The characteristic of 'Morelonomicon' is that it compensates for all the necessary firepower, CDR (+100 AP, + 20% CDR) mana on the attack surface of Mid AP Mage. Furthermore, the material "Lost chapter" is excellent, it can be said to be an item that is very easy to make. "Lost chapter" will restore 20% mana at the time of the champion's level up, so it will support the mana problem in the middle stage. When completing Morelo, the effect at level up disappears, but instead the mana recovery effect is activated at kill / assist. Conditional with Passive (gives magical damage when the opponent's physical strength is 35% or less) Recovery inhibiting effect. Many Mid AP Mage core items "Moreronomicon" are often piled as the first item. The reason is that without mana you can not work as a mage. Mana is first. 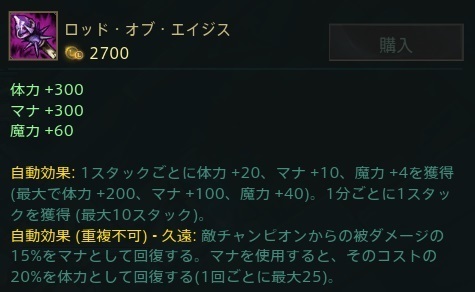 There are other AP items that supplement mana such as "Rod of Age" and "Tears of the Goddess", but there are a few power spikes (strong time zones) lagging behind and they do not give CDR Therefore, Moreronomicon is often adopted as aggressive AP Mage. Passive recovery inhibition is also quite effective if you have champions (Brad Mia, Solaka, Doctor Mundo, Bolivia, etc) that have strong recovery measures. Since the name of "Rod of Ages" came up, I will explain it here. "Rod of Ages" is an item that raises strength, mana, and AP (+ physical strength 300, + mana 300, + 60AP). In addition, stacks accumulate one by one every 1 minute from purchase (maximum 10), and the physical strength, AP and mana rise will grow with stack 1. You can gain physical strength +20, mana + 10, AP + 4 per stack, so it is up to physical strength +200, mana + 100, AP + 40 per stack. 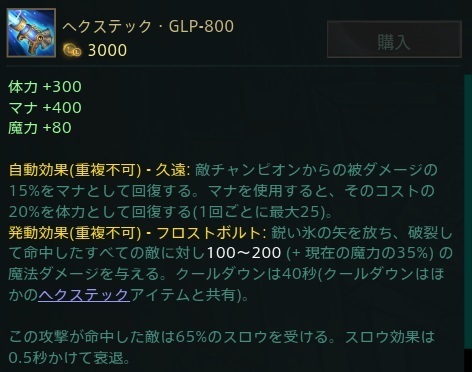 Together with the original performance, it becomes an OP item that gets + physical strength 500, + mana 400, + 100 AP after 10 minutes from purchase. It would be OK if you think it is a cane growing over time. Basically there are no choices other than the first item. It's possible that the game will end as a result of the game being violently moving, even if it is loaded in the latter half, it can not grow and grow. 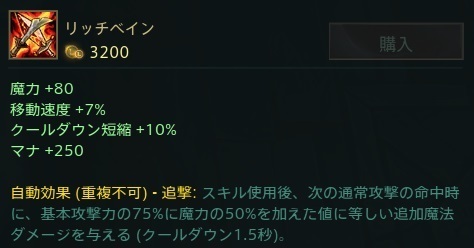 Although it is somewhat lonesome at the time of purchase, it changes to an OP item that is reliable over time, so it is not suitable for the champion who goes from the early stage to the champagne. It is the item to be adopted for the champion where the place of activity is visited in the minority races and collective warfare after the middle stage withstanding the lane fight of the opening stage. It is popular also for champions that are scarce in terms of protecting themselves because they have a short range because they can get physical strength. Will it be around Casus, Cassadin, Gillian, Swain, Chogas who is currently the first item as a core build with meta? Fate and brand, Annie, even per lisandra are considered as one of the first item's choices. Also, AP Mage who gets "tears of the goddess" purchases the "goddess of tears" and then purchases "rod of age" (see below). It is a very special item. The material "goddess's tears" is a special specification that raises equipment with skills, with the maximum value of mana increasing (up to 750 mana increase) every skill consumption and mana usage. 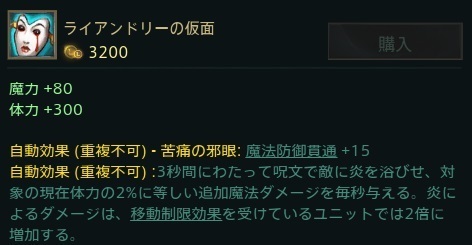 And the derived "Ark Angel Staff" has the effect that AP of 3% of maximum mana increase. AP is +80. 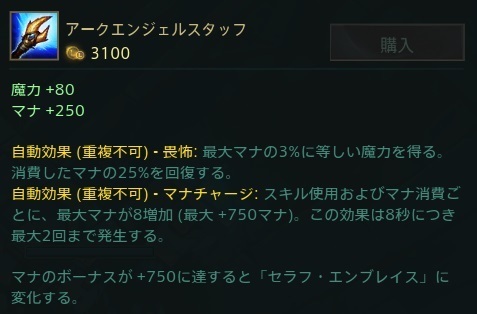 Even if "Tears of the Goddess" are derived to "Ark Angel Staff", the increased mana is inherited, and when the maximum 750 mana increase, "Ark Angel Staff" will automatically evolve to "Seraph / Embrace" at no cost. "Seraph / Embrace" has an Active effect that consumes 20% of the current mana and can create a barrier according to the amount of mana consumed. ... Why did Riot make items with such a complicated effect? My head got stuck up just by writing an explanation. There is no AP in "tears of the goddess", the other material "Muda dei Kai Rod" is also high, high synthesis cost, it takes time to accumulate the stack of "goddess's tears", etc. Because it is an item held, it is not adopted as an ordinary champion. It is said to be "a champion that consumes a very large amount of mana" or "a champion that grows its power according to increasing mana." In the current meta, the champion that is adopted as the core bead is Ultra Toggle (switched on / off) and Anibia who needs a lot of mana (recently received a Nerf of rip). Will it be two champions of rise that the skill damage grows according to it and increased mana? Recently, it seems that it is not fashionable to load this item in Casadin. There is synergy with "rod of age" which increases maximum mana. Let's say that the order of loading is "tears of the goddess" → "rod of ages" → "ark angel staff". I want to store tears and I also want to start accumulating the rod of August's stack as soon as possible. Oh, uh, you already have one champion. It is Cassiopeia. In addition to being able to turn E with tremendous momentum, she is adopted because she consumes a lot of mana. 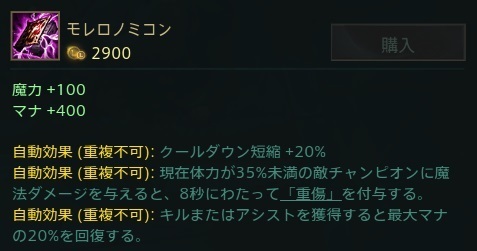 However, since you do not consume mana when you take CS with E, it is fundamental to purchase "Moreronomicon" after "goddess's tear" without loading "Rod of Aisis". Physical strength 300, + mana 400, + 80AP Although the status that I get is nice, I feel that it is a price 3000 Gold and a little expensive. It is 300 Gold higher than "Rod of Ages", and the status which can be ultimately obtained is also low, so it is not easily adopted. However, with the Active effect, "give a magic DM of 100 to 200 (+ 0.35 AP) to the enemy unit in the designated direction and give Slow (65%) to return to the original over 0.5 seconds. (Magic DM depends on Lv increase)"
I have the ability. Tsuyo yeah (impression as elementary school student). CD is 40 seconds. If you can not use the above Active effectively, you can do it with "Rod of Age". 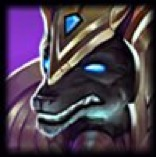 I have never seen any champions actually adopted as a core build other than Olelion Sol. It is adopted as a miraculous best match item as being able to hit an immediate slow at a short distance which is only a blind spot to Olelion · sol, to run away or follow good, Q will also be easy to apply. Although it should not be weak when piled on other champions, is not it "Rod of Ages"? There is not much room for a refutation if I told you. It has Passive of "pursuit" and "When you hit the next normal attack, give additional magic damage equal to 75% of the base attack power plus 50% of AP (CD 1.5 seconds ). "It has the effect of. Why is not it a universal item because it is because "you must enter AA". Most AP Mage has AA 's motion is not excellent, and it has a longer skill than AA' s range. And it is often more effective to raise the damage of those skills than raise AA damage. However, of course there are champions that Rich Bain will suit. For example, Fate, he absolutely enters the basic combo from W → AA (or W → AA → Q → AA), so he can make full use of the effect of rich Bain. There are synergies, such as echoes and casadines, because skills are strengthened by AA. Let's purchase with a champion firmly using rich Bain passive. For now, I will separate them here. Next time I will explain AP items that I could not explain here. This time it was a mana item and there were few ingredients "according to the situation" · · ·. Perhaps items that will be more important next time come out so please see if you like it!